Ice cream is always a popular dessert option and we now stock a delicious range of ice creams and a sorbet from Salcombe Dairy, based down in the South Hams. After starting life in a stone built shed in the middle of Salcombe in 1981, Salcombe Dairy has grown and prospered principally because the ice cream is so very good. And it is so very good thanks to the quality of the ingredients and the passion and exacting standards of the people who make it. The milk comes straight from the farm first thing each morning while the double cream comes in fresh from the creamery. You can’t get more local than that. Now, producing a great range of ice creams, frozen yoghurts and sorbets, Salcombe Dairy has proved itself a really top producer winning an impressive 23 Taste of the West Awards 23 Great Taste Awards 2 top 50 Tastes in Britain. Salcombe Dairy ice cream ingredients include Devonshire milk, double cream, unsalted butter, and raw cane sugar. All the ingredients are completely natural and the ice creams are egg-free and nut-free. We serve their Madagascan Vanilla, Strawberries and Cream, Stem Ginger, Rum and Raisin and Salted Caramel. 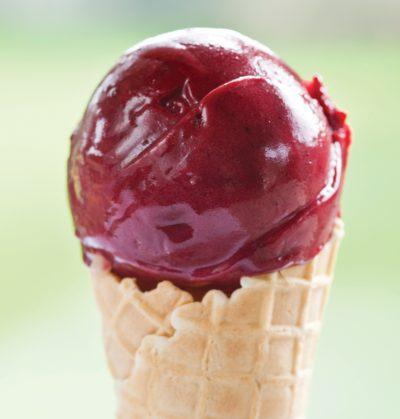 Their sorbets are the most wonderful colours, we sell their raspberry which is fabulous in both flavour and colour. So, next time you dine with us, and you fancy a light, but flavoursome dessert, you know where to look! PreviousPrevious post:Tour of Britain comes to Moretonhampstead!